Are you still freaked out by the robot arm in the corner of the classroom, or are you eagerly awaiting the future of STEM education without knowing where to begin? Don’t worry, we’ve got you covered. This guide will help you understand how 3D design using CAD (computer assisted drawing) programs like Tinkercad are essential to maximizing 3D printers in your classroom. Just as a standard printer takes a digital image and makes it a two-dimensional, tangible item, 3D printers take a digital object and create it in 3D right in front of your eyes. Quite literally, 3D printing opens an entire new dimension when it comes to K-12 STEM education and hands-on learning. 3D printers in the classroom allow students to think both mechanically and abstractly. The objects created by makers must be structurally sound and thoroughly planned before printing. For example, your design has to ensure that your object will be able to withstand the forces of gravity. Printing takes time as the maker’s arm and print head draws your object in 3D, so you may even have to design a supporting structure to be printed with your creation and removed later. But how do you even start the design process? CAD programs like Tinkercad allow you to create 3D objects in a digital space and easily export them to your 3D printer. Download this free, easy-to-use software and start playing around. After installing and opening the software, you can create shapes, merge them together or carve them out of one another. 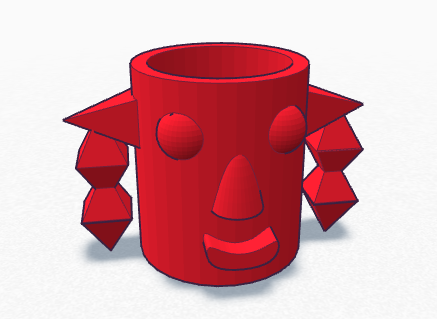 Anything you create in the program can be converted to a 3D printable file. While it may sound silly because you and I both live in a 3D world, we are very rarely confronted with all three dimensions of an object at once. Take a moment to think about the computer, tablet or phone you’re reading this from, and consider that you are only looking at about half of it. When you’re designing in 3D, you have to try to hold the whole of the desired object in your mind. Think about it like traditional printing. When you go to write a letter on your computer, you don’t just start typing away orders. You start with a greeting and type a body made up of paragraphs before ending with a signature. The printer then copies that structure of letters, and regardless of content, it will look like a letter. No matter what you want to print, you have to understand the underlying structure, or it won’t come out correctly. Tinkercad gives you the ability to visualize the whole design in a digital space before you create it. Once your students know the basics of 3D design and printing, the opportunities for class projects and after-school programs are endless. There are even new schools in California that have classes that are run like startups. With 3D technology, you can start a robotics club without breaking the bank. Let each member of the group or small teams of students design and print different structural parts of the robot while working as a team to make sure it works when it all comes together. You can use a program like 123D Circuits to plan out the mechanism that will power the bot. Project Ignite has a list of great ideas for engaging your students with 3D design and printing. An understanding of 3D design through 3D printing will open your students’ minds to a new dimension of possibility, all you have to do is help them get there.